Stainless Flexible Protection Tube & Connectors for Optic Fiber and other related materials and accsessories. Outstanding Flexibility, Standard models for general purpose.Thin diameter. Protection for stainless tubes/ sensor cords/electric cords/Armored flexible tube. Protection for stainless tubes/ sensor cords/electric cords. Outstanding Flexibility, Standard models for general purpose. Thin diameter. Stainless steeel casing tube with Olefin Elastomer sheathing. is consist of 3 layers of tubes. Stainless casing tube (Flexible Conduit) lined by fluorine or polyethylene sheath inside. And outside of the stainless tube is also coated by fluorine or polyethylene. Stainless steel wire is inserted into the spiral valley of the casing tube, create more flexible bending radius. Outstanding Flexibility & Can change bending radius, No elongation. High resistance to side pressure, high tensile strength. Stainless braided covered liner tube. Outstanding flexibility. Protection for Fiber used on endoscope. Outstanding flexibitily and durability. Unique feature to transfer torque. Stay bent, Airtight. Protection for stainless tubes/ sensor cords/electric cords. Stays bent. Microphone stand, desk lamp, floor lamp. Double layer structured stand tube. Shape retaining tube for aircraft, aut and lighting accessories. Airtight, durable for high pressure, shock absorb. Stay bent.Protect for optical fibers. Flexibile and durable for bending.Protect for optical fibers and medical use. No elongation. Outstanding flexibility.Ideal for application to supply nozzle for hot water heater & water purifier. Covering for fiber protecter tubes. Waterproof, oilproof, fireproof. Flexible Tube Materials(Fiber Protector). To hold end of tube/Screw type.Protect optic fiber from damage by end of the tube. For attaching amp unit for sensor system. Tube end treatment. Adhesion type. Tube end treatment. In 2 types. How to choose products For various sensor cable. Fiber Protector Technical Data Test resoults. General purpose, Chemical resitance, Heat resistance. 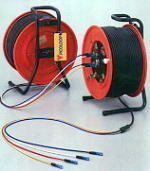 Applicable various ways of protection laying optical fibers and communication cord laying. Thin, light weight, easy handle like electric wires. Outstanding strength against side pressure, tensile and bending. Picoflec/Code-Picoflec. Outstanding strength against side pressure, tensile and bending. Flexible stainles steel tube safeguards your optical fibers. Metallic Delivery hose, Protect tube, Fiber optics protect tube, Square locked conduit,Braided stainless hose, Hagitubing, Hagitube,Interlock conduit, Metal hose, Shower hose cover, Stainless steel hose, Steel conduit fitting, Titanium tubing, Wirering conduit,Flexible metal hose, Steel tubing, Stainless steel tubing, Fiber optics cable. All rights reserved 2005,HAGITEC CO.,LTD.